FOR Internet marketers Harrace Lau and Fione Tan, nothing comes more naturally than sharing their wedding moments with friends and family on the Net. Tan, who hails from Kuala Lumpur, and Hong Kong-based Lau created a wedding Web site (http://www.9wedding.com) and a wedding blog (http://www.eonenet.com/wedding_blog/) in January last year, several months before their wedding receptions in Hong Kong and Kuala Lumpur in March and June that year respectively. “The reason we created the sites was because both of us are in the Internet industry, so we wish to create an Internet themed wedding, which is probably the first of its kind in Malaysia. So, this will be the most memorable wedding that we and our guests can experience,” Lau says.
" 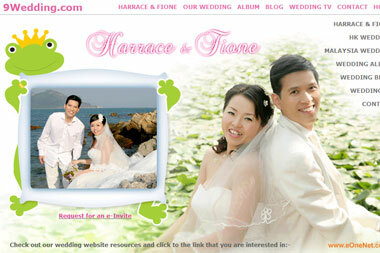 New Straits Times - Harrace Lau & Fione Tan "
From the beginning of the wedding planning, the couple utilised the Internet to send out virtual custom-made e-cards to their guests. The invited guests were given a password to confirm their attendance. There was even an online form for other interested participants to apply for an invitation to the event. “Since we have friends from many parts of the world, from the Middle East to France and Canada, we had to get the updated information to all guests on time and allow them to correspond to us as well. “For guests who were unable to join our wedding in two cities, they would be able to view the photos, news coverage and online videos from our Web site and blog,” Lau says. Prior to the wedding day, the information on the wedding was placed on the Web site and blog such as the wedding agenda and the story of how the bride and groom met. 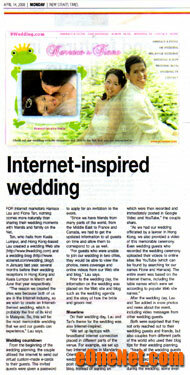 On their wedding day, Lau and Tan’s theme for the wedding was also Internet-inspired. “We set up laptops with broadband Internet connection placed in different parts of the venue. For example, we set up two Internet tables in Mandarin Oriental KLCC and allowed wedding guests to immediately post comments to our wedding blog. Instead of signing an attendance book, guests were requested to convey their wishes at our video kiosks which were then recorded and immediately posted in Google Video and YouTube,” the couple share. After the wedding day, Lau and Tan added in more photos and news about the event, including video messages from other wedding guests. Both were surprised that they not only reached out to their wedding guests and friends, but also couples from different parts of the world who used their blog tips for their wedding planning. “Nearly all the wedding guests in both our wedding receptions were amazed at the technologyrelated activities they could do during the wedding; some even mentioned it looked more like a show than a typical wedding dinner,” Tan points out.